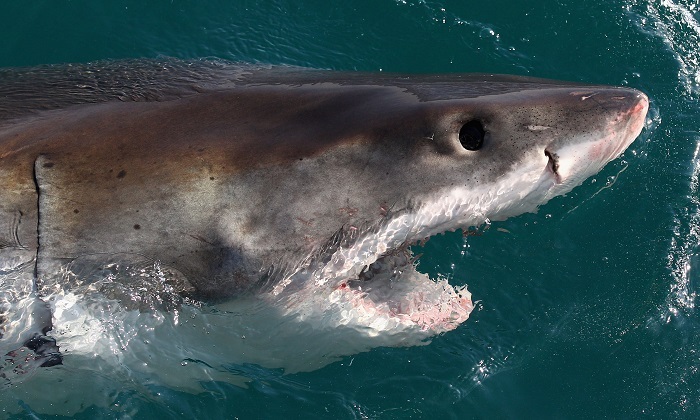 Vacationers got more than they bargained for when they had a great white shark circling their chartered boat on and off for 45 minutes. A group of five Wisconsin natives were fishing off the coast of South Carolina last Friday when the feared predator approached the boat and began checking them out, reported myrtlebeachonline.com. Chip Michalove, owner-operator of Outcast Fishing on Hilton Head Island, was also surprised. They had only planned an afternoon of catching and releasing smaller fish. “At about noon I saw a big shadow behind the boat, and I was surprised because I was so close in shore,” said Michalove. “The shark came in. It would circle the boat a few times, and then it would leave,” he said. Michalove said his customers “were absolutely blown away,” by seeing the large shark, which he said was around 15 feet long. “They said, ‘How in the world are we going to be able to top this?’ They were so excited they were speechless by the end of the day,” Michalove said. The veteran fisherman said that to see a great white out there would typically take up a couple of days of active searching. “To only be out there for a couple hours and have one circle the boat was pretty rare,” he said. He said the shark may have thought his boat was a dead whale. A family in Australia also had a similar experience this week with their boat being circled by another large great white. The Brown family caught the shark on video while they were out fishing off the west coast of Yorke Peninsula. Mother Jodie Brown told The Advertiser they had been out on the water for a couple of hours before the shark appeared. “It just swam up to the boat from behind and it was just circling us for about 20 minutes, it would just go round and come back again,” Brown said. Brown said that the shark wasn’t at all aggressive.